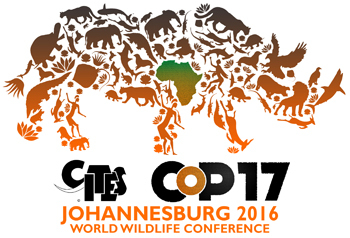 Media are invited to register for the 17th meeting of the Conference of Parties to the Convention on the International Trade in Endangered Species of Wild Fauna and Flora (CITES CoP17), or the World Wildlife Conference, to be held in Johannesburg, South Africa, from 24 September to 5 October 2016. The South African Minister of Environmental Affairs, Mrs Edna Molewa, on 3 March 2016 signed the Host Country Agreement for CITES CoP17 with the Secretary-General of CITES Mr John E. Scanlon on the margins of an international conference on wildlife crime in The Hague, the Netherlands. South Africa was one of the first signatories to CITES in 1975 and continues to play an active role in the implementation and enforcement of the Convention. CoP17 is set to be the largest ever meeting of the Conference of the Parties, with a record number of agenda items, side events and delegates expected to attend. At CoP17, Parties will collectively evaluate the progress made since the last meeting of Conference of the Parties in 2013 and will consider 62 proposals (involving 500 species) to increase or decrease controls on international trade in wildlife animals and plants, submitted by 64 Parties from around the world. Amongst the species involved are African elephant, white rhinoceros, lion, pangolins, sharks, devil rays, as well as many species of rosewood, crocodiles, birds, frogs, lizards, turtles, and other animals and plants. CoP17 will also take decisions concerning the CITES budget, livelihoods, traceability and sustainability of trade, combating illegal trade, including fighting corruption and cybercrime, demand reduction strategies, national laws and compliance. These will guide the work of the Parties and the Secretariat until CoP18 in 2019. The CoP will be preceded by a high-level Ministerial Lekgotla on CITES and the UN Sustainable Development Goals, hosted by South Africa. Media are required to register online at least four days prior to arrival at the Conference to meet security screening requirements. Media will not be able to register on arrival at the venue. 2. Media wishing to broadcast live from the conference are required to apply for a temporary broadcast license from the Independent Communications Authority of South Africa (ICASA). Applications to ICASA for live broadcast permits closes on 12 September 2016. ICASA permits are not required for media streaming and web-casting from the Conference. 3. Accreditation can be collected, at the Sandton Convention Centre, from 20 September 2016, between 08:30 and 18:00.